Don’t let the first name fool you. 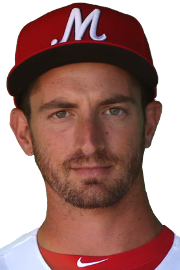 Reliever Ryan Sherriff (St. Louis Cardinals/AAA) is the latest player to join the growing roster of Jewish pro baseball players. The 26-year-old southpaw is enjoying a tremendous season with the Memphis Redbirds. Sherriff is 2-0 with a 1.45 ERA — third-best among Pacific Coast League players with at least 30 innings pitched — and is limiting opposing batters to 0.96 walks/hits per inning and a batting average of .176. You might say the California native is pitching beneath the radar. When MLB.com issued its most recent list of the Cardinals’ top 30 prospects, Sherriff’s name was nowhere to be found. That’s okay. He’ll let his left arm do the talking. Selected by St. Louis in the 28th round of the 2011 draft, Sheriff has a career ERA of 2.89 since then. Why so many parents of Jewish baseball players have named their son “Ryan” is a mystery. (As Sherriff’s Twitter feed correctly implies, the name is often translated as “little king.”) Sherriff joins four current or former major leaguers named ‘Ryan’ (Ryan Braun, Ryan Kalish, Ryan Lavarnway, Ryan Sadowski), one 2016 draftee (Ryan Gold), and one current independent-league player (Ryan Lashley). Check out this video to get a sense of who Ryan Sherriff is. Thanks to our friends at JewishSportsReview.com for confirming our reader’s tip.